Pathogenic variants in mitochondrial aminoacyl-tRNA synthetases result in a broad range of mitochondrial respiratory chain disorders despite their shared role in mitochondrial protein synthesis. LARS2 encodes the mitochondrial leucyl-tRNA synthetase, which attaches leucine to its cognate tRNA. Sequence variants in LARS2 have previously been associated with Perrault syndrome, characterized by premature ovarian failure and hearing loss (OMIM #615300). In this study, we report variants in LARS2 that are associated with a severe multisystem metabolic disorder. The proband was born prematurely with severe lactic acidosis, hydrops, and sideroblastic anemia. She had multisystem complications with hyaline membrane disease, impaired cardiac function, a coagulopathy, pulmonary hypertension, and progressive renal disease and succumbed at 5 days of age. Whole exome sequencing of patient DNA revealed compound heterozygous variants in LARS2 (c.1289C>T; p.Ala430Val and c.1565C>A; p.Thr522Asn). The c.1565C>A (p.Thr522Asn) LARS2 variant has previously been associated with Perrault syndrome and both identified variants are predicted to be damaging (SIFT, PolyPhen). Muscle and liver samples from the proband did not display marked mitochondrial respiratory chain enzyme deficiency. Immunoblotting of patient muscle and liver showed LARS2 levels were reduced in liver and complex I protein levels were reduced in patient muscle and liver. Aminoacylation assays revealed p.Ala430Val LARS2 had an 18-fold loss of catalytic efficiency and p.Thr522Asn a 9-fold loss compared to wild-type LARS2. We suggest that the identified LARS2 variants are responsible for the severe multisystem clinical phenotype seen in this baby and that mutations in LARS2 can result in variable phenotypes. The online version of this chapter (doi: 10.1007/8904_2015_515) contains supplementary material, which is available to authorized users. We are indebted to Enduo Wang (Shanghai) and Susan Martinis (Urbana) for their generous gifts of clones encoding LARS2 and editing deprived E. coli LARS, respectively. This research was supported by a National Health and Medical Research Council of Australia (NHMRC) Project Grant APP1026891. RLD is an NHMRC Early Career Fellow, DRT is an NHMRC Principal Research Fellow, STC is an NHMRC Career Development Fellow, and CMS is an NHMRC Practitioner Fellow. MDF and KM are supported by RO1 DK 087992 from the US National Institutes of Health. We are grateful to the Crane and Perkins families for their generous financial support. LARS2 variants that result in reduced LARS2 aminoacylation activity were identified in a patient with a novel phenotype: hydrops, lactic acidosis, sideroblastic anemia, and multisystem failure. Lisa G. Riley, Joëlle Rudinger-Thirion, Klaus Schmitz-Abe, David R. Thorburn, Ryan L. Davis, Juliana Teo, Susan Arbuckle, Sandra T. Cooper, Magali Frugier, Kyriacos Markianos Carolyn M. Sue, and Mark D. Fleming declare that they have no conflict of interest. 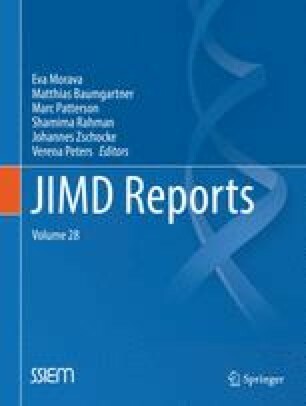 John Christodoulou is a communicating editor of the Journal of Inherited Metabolic Disease. All procedures followed were in accordance with the ethical standards of the responsible committee on human experimentation (institutional and national) and with the Helsinki Declaration of 1975, as revised in 2000 (5). Informed consent was obtained for all individuals sequenced in the study. This article does not contain any studies with animals. LGR performed Sanger sequencing, immunoblotting, and cloning and wrote the manuscript; JR-T and MF designed and performed in vitro aminoacylation assays; KS-A performed WES analysis; DRT provided mitochondrial RC enzyme activities and mtDNA depletion results; RLD and CMS performed mtDNA sequencing and analysis; JT performed bone marrow aspiration and described sideroblastic anemia; SA provided hematology and histopathology images; STC supervised the Western analysis and provided the developmental muscle samples; KM supervised WES analysis and interpretation; MDF and DRC participated in WES analysis and surveyed additional phenotypically similar patients for mutations. JC was involved in the initial diagnosis and management of the patient, obtaining consent and samples for the study, and contributed to the overall conception and progression of the study. All authors contributed to editing the manuscript.